In 2013 alone, I saw all the Provinces of Canada, mostly by train. I took a train from Toronto to Moncton, New Brunswick, on a trip to the Maritimes, which was the first time I slept on a train. I took a train from Buffalo, NY, north to the tundra to see polar bears migrate in Churchill, Manitoba. I rode though the gorgeous Canadian Rockies by train, and it was one of the most spectacular places I have ever seen. And of course, I took the Amtrak from New York City to Rochester, NY for Christmas. 2012 really started my new obsession with train travel. Although I spent many, many hours taking the Amtrak from NYC to Buffalo when I lived in the city, I has usually worked the night shift before and spent the entire ride sleeping. And yes, I used to ride the subway just for fun and entertainment. So I guess I’ve always had a thing for trains, but real train travel started with our honeymoon in Europe. We started in London, then took the Eurostar to Paris. 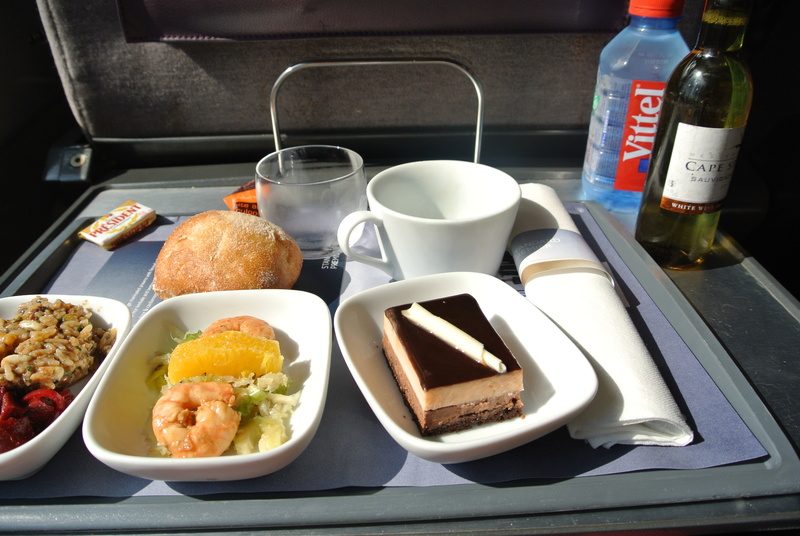 Meal served in business class on the Eurostar. Tip #1: Be sure you pick your own seat on a day trip train, especially if you sit in business class. We let them pick our seats, and we had to go backwards for the whole ride. Going backwards on the Eurostar isn’t really a big deal, because it goes so fast, and it’s so smooth, that you don’t really notice. But I’m sure for some people, it could really ruin the trip. The Eurostar arrived in Paris at the Gare du Nord station. We were leaving Paris and going to Epernay for a few days. We took the Provence TGV train, out of the Gare de l’Est. A few people at the train station told us to take a taxi, but I was smart enough to look it up and it was a just a few blocks away. Gorgeous train station in Paris. 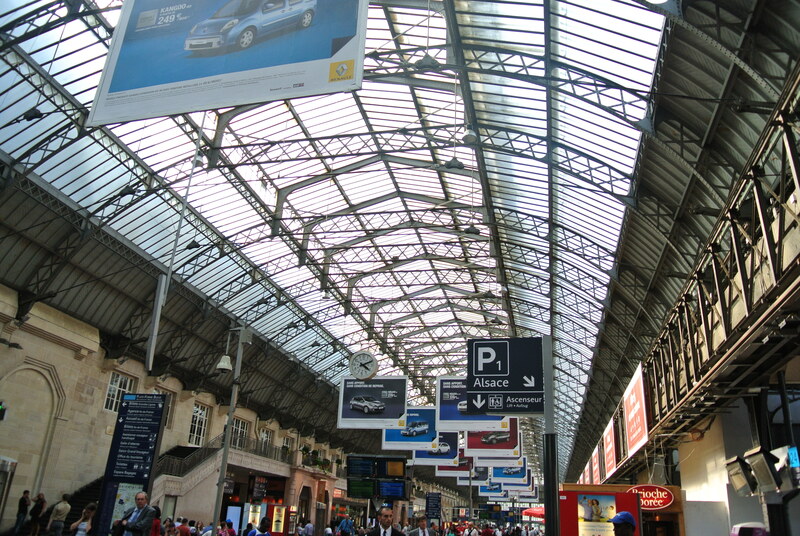 Tip #2: Train stations are almost always in the city center and close to a lot of things. Don’t be afraid to walk with your suitcases and save a few bucks. We did not follow that rule in Epernay and took a taxi from the train station to the hotel. Turned out that the hotel was really close and thanks to one way streets, was way longer by car. We still didn’t meet the minimum requirement for the taxi and had to pay extra. Lesson learned. 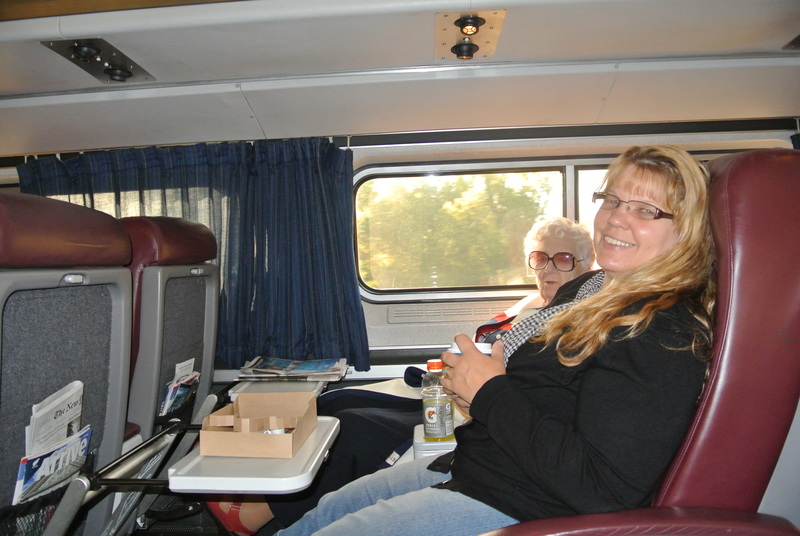 My next trip on the train was my family’s first girls trip. Mother, grandma, and I took the Amtrak across New York from Buffalo then north to Montreal, riding with the Adirondacks on our left and the Green Mountains of Vermont on the right.We started the trip in business class, but the train we had to switch to to go north didn’t have business class. Instead, they had a dome car. As beautiful as it was, it was still a bit boring. The dome car, although very scenic, was sort of cramped, making it kind of uncomfortable. Mom and grandma in business class on Amtrak. Soda, water, and coffee is included. Food (which is just microwaved stuff) and alcohol are not. 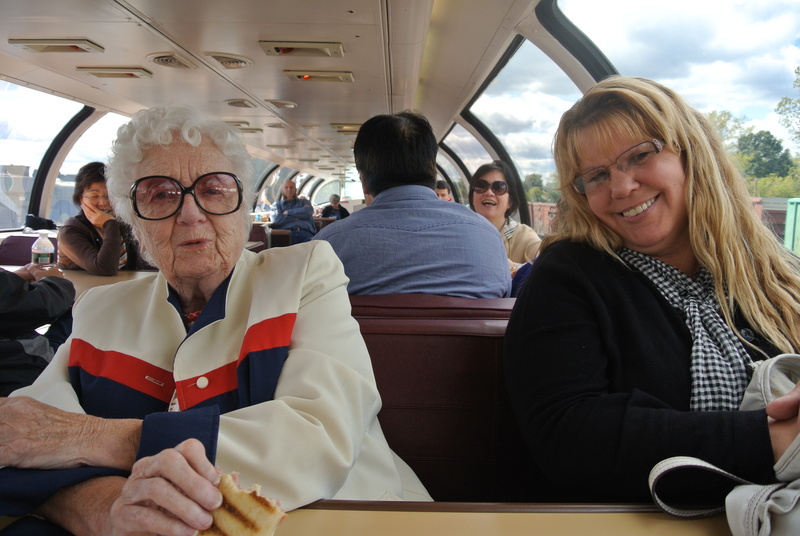 Grandma and mom in the dome car. Tip #3: Bring lots of entertainment. I’m taking iPad, iPhone, chargers, headphones, games, cards, anything that you enjoy. And just when you think you have downloaded too many books, movies, etc on your tablet, download one more. Because you will get bored. We took the VIA Rail from Montreal to Quebec City. 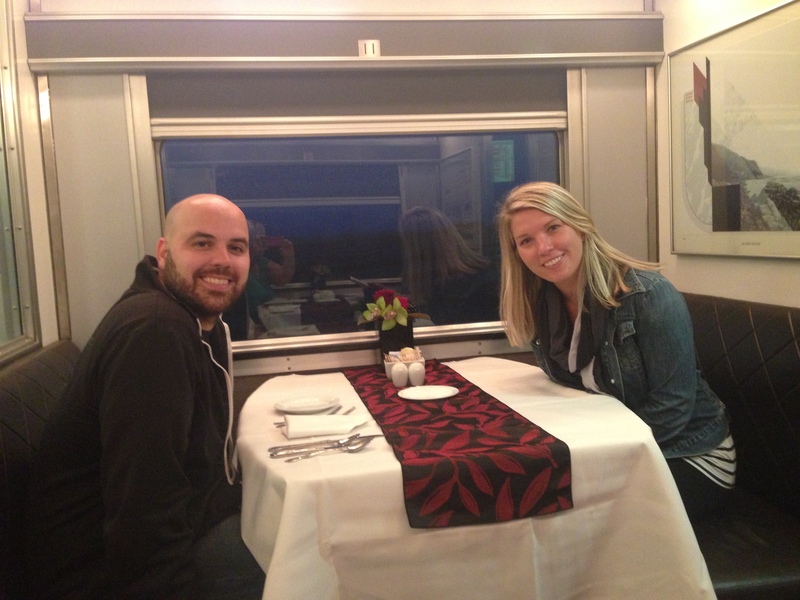 It was our first time taking the VIA Rail and holy cow, it was awesome. Kind of ruined the Amtrak for us forever. 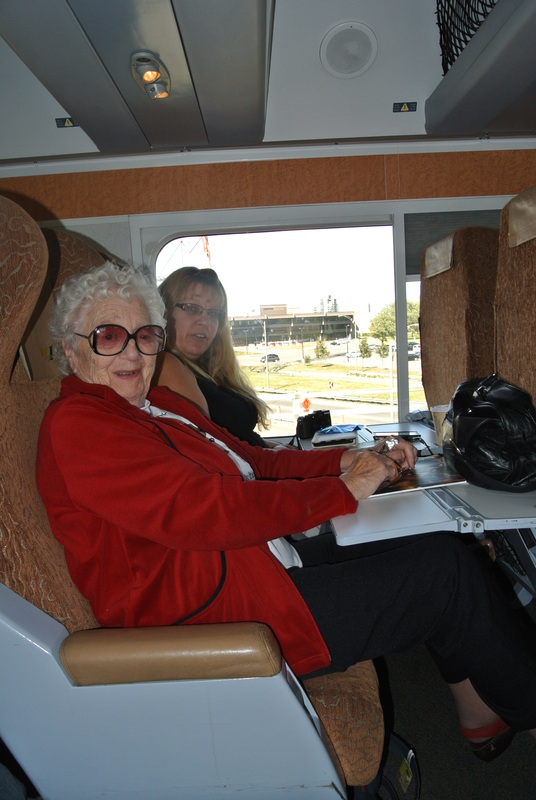 Grandma and mom on the VIA Rail to Quebec City. 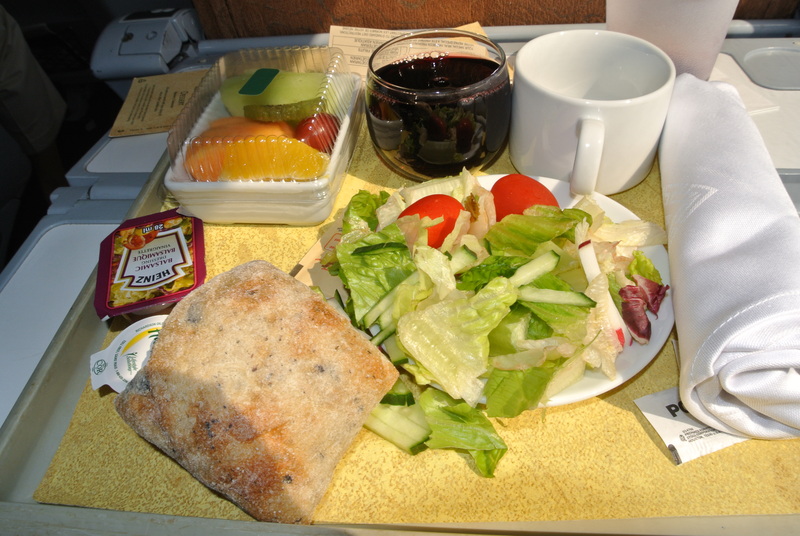 Meal in business class. Food and alcohol is included. So you can see the difference between business class on the Amtrak and the VIA Rail. Now I will say that the Amtrak is cheaper. But the VIA Rail is 100% worth the cost of the upgrade. Tip #4: Know what is included in your ticket and whether you will need cash to buy food and drinks. The Amtrak includes soda, coffee, tea, and water with their business class ticket. The food and alcohol is for purchase. The food is mostly microwaved stuff, chips, or our favorite, the cheese platter. Make sure you have cash because sometimes the card machine doesn’t work. I once took the nine hour ride from NYC to Buffalo on a train with a broken card machine and I was STARVING when I got there. On the VIA Rail commuter trains, the business class ticket includes an alcoholic beverage when you get on the train, a full meal and dessert with another alcoholic beverage, coffee, soda, snacks, pretty much everything. And you have delightful attendants that serve you. If you take the VIA Rail Canadian across the Rockies, all food is included. They have a nice dining car with linens and china. There are crackers, pastries, and croissants out during the day. They have complimentary champagne on departure from Toronto (or Vancouver) and sporadic wine and beer tastings during the trip. Any other time, you must pay for alcohol. If you take the VIA Rail to Churchill, Manitoba, nothing is included. Not coffee, tea, water, food, nothing. Which is quite surprising, considering the hefty cost of the sleepers on the train. Either way, the food is microwaved, just like the Amtrak. And they have a lovely little kitchen on the train but apparently it wasn’t cost effective to service food from it. There is a little refrigerator in the snack car that the attendants might let you use, if you’re nice. They will also heat up pizza for you, if you go get it when you stop in Thompson (read here about Thompson). Tip #5: Bring your own food and drinks. Buy a 12 pack of soda that everyone likes. Bring a bottle of wine with a screw off top or a bottle booze, to go with the soda that everyone likes. Bring your favorite snacks and nonperishables. Peanut butter crackers were our savior. You can drink all you want to in your room and it’s way cheaper. The temperature in trains in not very easily regulated. We learned that temperature can be 10 degrees different just a few seats away. Tip #6: Wear comfortable, layered clothes. I practically lived in leggings, long tank tops, light sweaters, and scarves the entire time on the train. I could sit comfortably anywhere, just removing or adding layers as needed. But no matter how comfortable I was during the day, I was horribly uncomfortable at night. We had sleeper rooms for every leg of the trip but it didn’t matter. 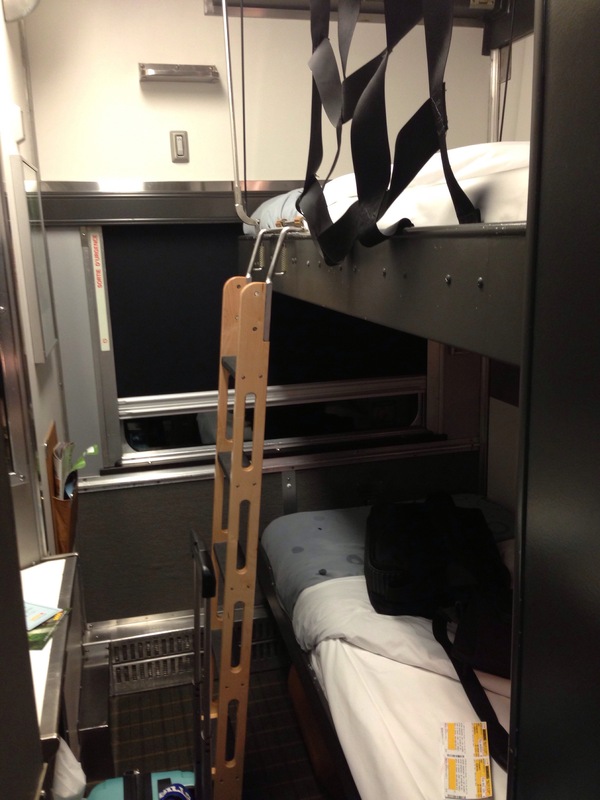 I couldn’t sleep on the top bunk, because I could feel the train moving too much and it scared/nauseated me. I couldn’t sleep on the bottom because the Husband was in the way. And pretty much anytime I fell asleep, someone walking by and talking woke me up. Tip #7: Bring seasick pills and earplugs. I do not get seasick. I have no problem riding in the backseat of a car or reading in motion. However, I was terribly seasick sleeping on the train. I learned just how wonderful Dramamine (or it’s Canadian equivalent, Gravol) is. So be sure to have some on hand, even if you don’t normally get sick. No worse way to ruin a trip than being sick. And trust me, people are loud, even when they think they are being quiet. Nothing is louder, I swear, than a man saying, “Shhh honey, people are sleeping!” in the loudest whisper ever. You will need earplugs. And the worst part about a trip is getting to your destination, all tired and somewhat grumpy from lack of sleep, to realize all the beautiful photos you took on your cell phone are blurry. Truth is, the train goes pretty fast for the most part. You will not get a good cell shot as a general rule. 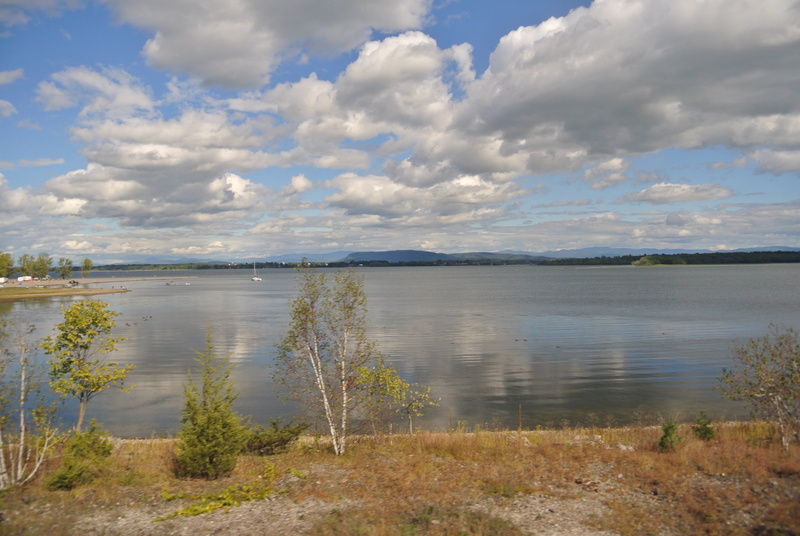 Tip #8: Take a video of the pretty scenery while the train is moving, then use a screen shot of that for photos. The video won’t be (as) blurry and you will then have both videos and photos to remember your trip. All you need to do (for the iPhone, it’s the only one I know how to work) is push pause, then hold down the lock and home button. Voila! You have a clear photo from a moving train. I feel so lucky that I was able to travel so much on the train and even though it gets boring sometimes, I really, really love the train. There is something about taking the slow way, not rushing rushing rushing, through a trip. I will admit, I have always traveled the nicest way by train and I’m sure being squished in coach for hours or even days would not be as enjoyable. Or maybe it would. Either way, it’s worth the experience of traveling by train.